We all love summer, don’t we? It’s the time to get out and enjoy the great outdoors, providing of course that it’s not TOO hot! But what should you be aware of that could present a danger to your pet in the summer? Walk your dog in the cooler parts of the day – early morning and evening. Try booties to protect their paws. Many dogs won’t tolerate them, but it’s worth a go! Cars are always a danger for pets, in particular when they are moving. But also a danger in the summer is that cats in particular like to seek out the shade and have a snooze under cars. So best to have a quick squizz under the car before you set off, and even do a quick toot, just in case you miss something before you pull out. It’s natural to think that your dog would love a swim to cool off, but it is important that they are supervised, as getting in may be easier than getting out for them. Please do not force your pet into the water. Some dogs are simply not water lovers. Check out this article “Summer water safety for pets” for more information about keeping your pet safe around water. Don’t let your pet drink pool water – it can be toxic. Just make sure there’s lots of fresh drinking water around. After a swim in chlorinated water, give your pet a rinse off as chlorinated water can cause skin and eye irritations. Many dogs love the beach! 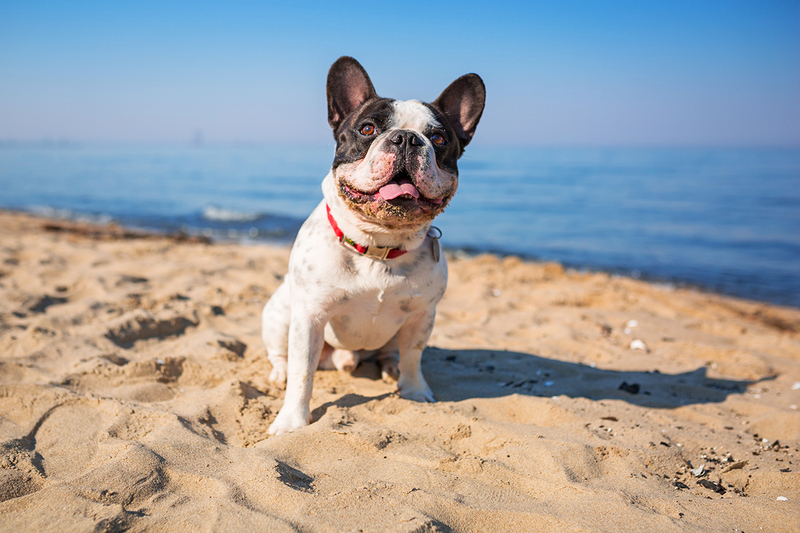 Two things to be aware of are saltwater toxicity – if your dog drinks too much seawater – the signs would be vomiting and diarrhea (easy solution – supervise, and provide fresh drinking water), and like the sidewalk, the sand on the beach can also become extremely hot and burn tender paw pads. In the midst of summer it is simply wiser to keep your dog cool and calm during the heat of the day, and take him out early morning or evening. Not only will there be less people around, but you will be preventing the potential for paw burns and heatstroke. Whilst we don’t to be alarmist, we do want people to be aware. Prevention is better than a cure, and if you can avoid a trip to the vet for an avoidable emergency, all the better. But obviously things can go wrong and if you suspect an issue, the first port of call should be your Vet, and don’t forget pet insurance can help with the vet’s bills for unexpected accidents and illnesses.